Amazon has launched on Australia’s $100 billion food and grocery market, prompting complaints from Woolworths that multinational suppliers are favouring the e-commerce giant with cheaper prices on brands such as Colgate, Huggies, Omo and Finish. Woolworths sources said Amazon.com.au was selling food and groceries at lower prices than Australia’s largest supermarket chain on a number of products and in some cases at prices below Woolworths’ purchase price. “The question is are they selling below cost, which would be inappropriate. Do they have global [pricing] deals or are Australian suppliers giving them better deals than the major supermarket chains – it’s not clear,” a Woolworths source told The Australian Financial Review. Woolworths, which accounts for about 38 per cent of the food and grocery market, plans to seek a “please explain” from suppliers early in the new year. 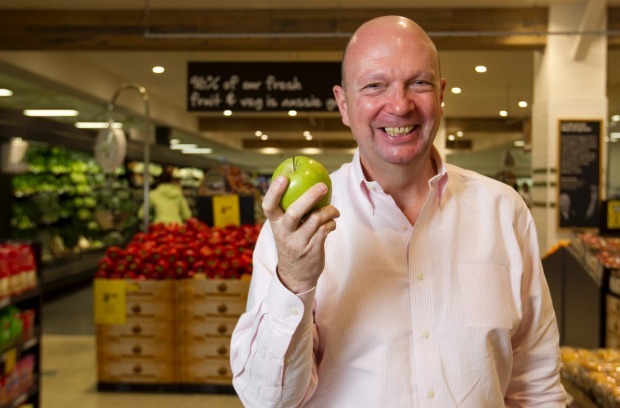 At Woolworths’ annual meeting in 2017, chairman Gordon Cairns warned food and grocery suppliers could “cut their own throats” by selling on Amazon and losing control over prices and losing business with the major chains. Woolworths sources said Amazon.com.au was selling food and groceries at lower prices than Australia’s largest supermarket chain on a number of products. “I’m not telling them what they should do, but before they step into the breach they should perhaps consider the long-term ramifications,” said Mr Cairns, the former chief executive of dairy and drinks business Lion and a former senior executive with Pepsico and Frito-Lay. Mindshare chief strategy office Joe Lunn said Amazon Australia’s share of the food and grocery market was small but growing fast. 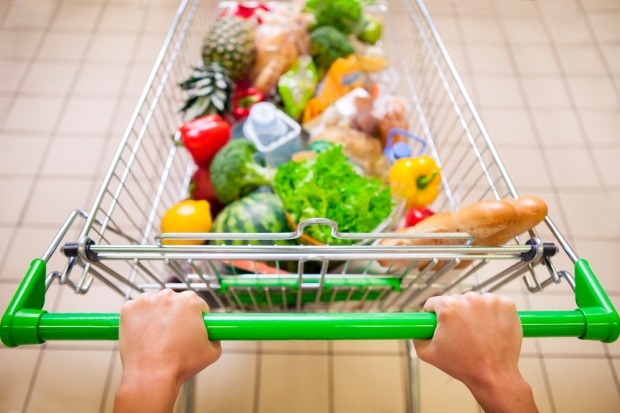 “Back in March nobody was buying food and groceries from Amazon whereas … now 4 per cent of Amazon buyers are buying food and grocery from Amazon,” Mr Lunn told the Financial Review, citing a Mindshare survey conducted last month. Woolworths chairman Gordon Cairns warned food and grocery suppliers could “cut their own throats” by selling on Amazon. Amazon.com.au now has more than 2500 food and grocery products on its site, ranging from packaged foods such as Carmans muesli, Kellogg’s corn flakes, Milo milk powder and Mount Franklin mineral water to Finish dishwasher tablets, Omo clothes powder, Huggies nappies and wipes, Colgate toothpaste and Cuddly fabric softener. Some food and beverage prices are also cheaper on amazon.com including Kellogg’s rice bubbles ($3.75 v $6) and Mount Franklin bottled water (20 by 500ml, $5.50 v $6.50 at Woolworths and $9.20 at Coles). After factoring in free delivery through Prime, which is available for most of Amazon’s food and grocery items, the price gap is even higher. However, prices on many other products on Amazon Pantry, such as Nestle’s Nescafe Blend 43 ($9.39), Nutella ($3.70), Masterfood chilli powder ($2.90), Arnott’s Tim Tams ($2.50) and Dolmio tomato sauce ($2.00) are identical to Woolworths’ and Coles’. Amazon.com.au now has more than 2500 food and grocery products on its site. 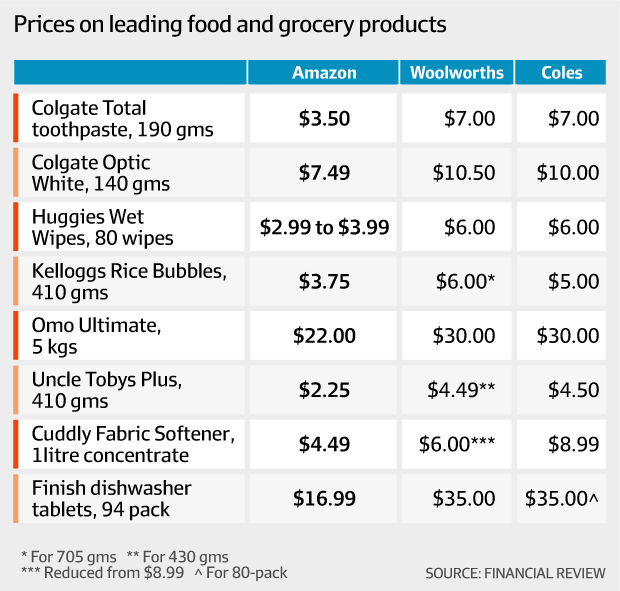 In some instances Amazon’s prices are cheaper than the major chains’ on leading Australian-made products – such as Carman’s fruit and nut muesli ($3.90 on Amazon.com.au, $5.70 at Woolworths and $5.70 at Coles but on special this week at $3.90) – which would not be available through grey channels. Coles is also understood to be concerned about Amazon’s pricing but declined to comment on Thursday. Former Wesfarmers chief executive Richard Goyder warned two years ago that Amazon, which trades 24 hours a day, seven days a week and can take advantage of its global pricing power, would “eat all our breakfasts, lunches and dinners” unless local retailers lifted their game. 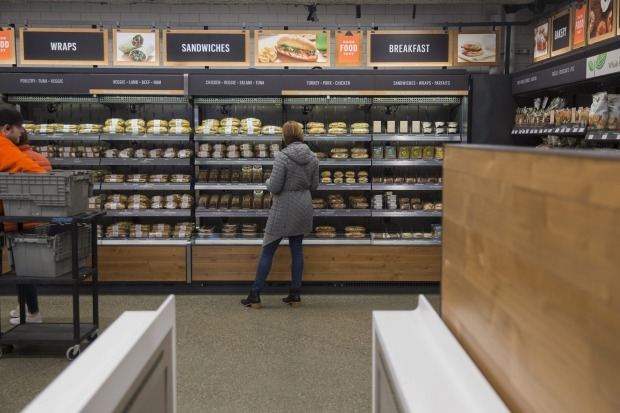 “We obsess over the things we believe customers will always care about – low prices, vast selection and fast delivery – and work hard to provide all three, all the time,” a spokeswoman said.